If one (or more) dog has resided in your home for awhile, and you plan to introduce another dog into the family — like a puppy — then at some point you are likely to sense some jealousy or have some issues with dog aggression. It happened in our home! This is natural — primarily because the dogs’ instinctual pack behavior comes into play and a hierarchy must be established as to who is the “lead dog” (Alpha), the “second in command” (Beta), and so on down to the “lowest ranking dog” (Omega). If there was only one dog in the home before, then the new dog will quickly learn that the older dog is the big cheese around here. The older dog calls the shots as to what the new dog can do, what toys he can play with, what food he can eat, when he can receive pets from you and others, when it’s time to play, etc. For the most part, this all happens naturally, and without incident — especially when you’re dealing with an older dog “teaching” a younger dog how things are to be done. 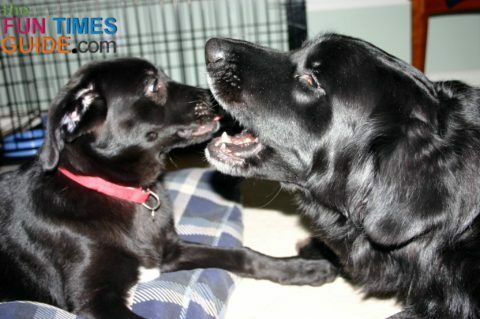 However, when you introduce a new dog (especially a puppy) into a home that already has 2 (or more) dogs, then you will likely notice some peculiar dominant or aggressive behaviors from one or more of the older dogs. The reason: they are trying to establish the pack’s dominance hierarchy. You see, every time you add a new dog into the mix, the “dog hierarchy” must be completely restructured in order to accommodate all dogs that are currently in the home. In our case, we already had 2 dogs. The 16-year-old American Eskimo male (“Jersey”) had clearly determined his place as the “big cheese” when we introduced a new male puppy (“Destin”) into our home 2 years earlier. For the most part, that introduction and transition went well. The puppy accepted his role as “second fiddle” in relation to the older dog’s status. There were no major incidents. However, 3 years later, we introduced a third puppy into the mix (another male, “Tenor”) and we immediately saw some dominant/aggressive behaviors that we knew we needed to gain control of early. 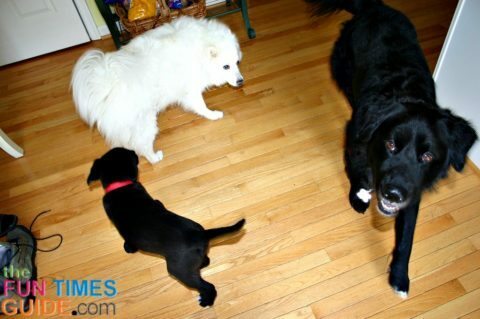 The middle dog (“Destin”), who until now had been the submissive one, immediately assumed the role of “leader of the pack”. This was primarily due to the fact that the eldest dog (“Jersey”) was completely aloof to the whole idea of having another dog in the family. Jersey wasn’t taking any kind of leadership role in this dog pack, so Destin stepped up to the plate to do it. As a result, this completely changed the dog hierarchy in our home. The tricky part came when Destin had to learn just how far he could go with his new-found pack privileges. Early on, it was clear that both Jersey and Tenor accepted their inferior status to Destin’s “leader of the pack” mentality. But sometimes Destin took it too far with the new little puppy (“Tenor”), and he appeared to more or less be bullying the little guy. 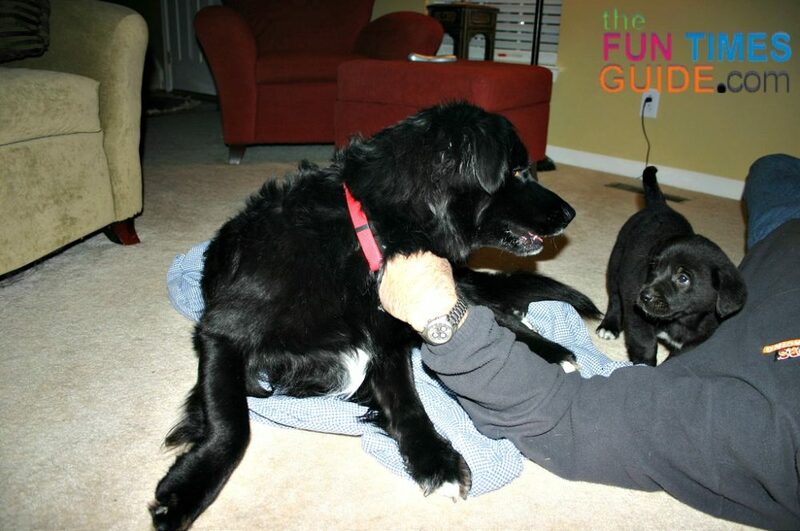 Since Destin is has always been a gentle, sweet and very good-natured Black Lab/Golden Retriever mix, these rare bouts with aggression troubled us greatly. They seemed to be largely unprovoked, and never centered around the same thing (be it food, bed, toys, or affection). We struggled for a few weeks as to whether or not this was a food aggression problem (because sometimes it happened around food) or purely a dominance issue (because it was never clear when or where Destin would “turn it on”). In the end, the aggression Destin displayed toward the new puppy seemed to be primarily a release of pent-up frustration for him. It was as if he had taken on such a huge responsibility as the “middle dog” who had to become the “big dog” and keep all other dogs in line 24/7. Dogs are always happier not to have to be pack leaders. Destin simply had to learn that he could turn it off sometimes. That it was okay if he was sleeping while the other dogs were playing. That he didn’t need to look out for and “protect” the other dogs all the time. And that he was still loved unconditionally, despite having this new dog in the house. Once Destin was clear of our undying love for him, despite the addition of this new puppy, he seemed to lighten up a bit. Eventually, Destin started “playing” more with Tenor, rather than just “babysitting” him. Today, these 2 dogs are pretty much best buddies. They still have their issues on occasion, because they both have dominant personalities, and they’re both males. But for the most part, they get along, and there’s nothing better than watching them “jaw” at each other for hours — in between the times when the little guy dives head-first into Destin’s furry belly and they begin playing rolly-polly and hugging games. It’s priceless! Intact males are more likely to exhibit dominance aggression than neutered males or females. Females who show aggression before puberty and who are spayed become more aggressive. Dominance aggression and protective aggression are the #1 and #2 causes of treatment by behaviorists. Protective aggression is stimulated by sudden movements. Dominance aggression is likely controlled by androgen and runs in family lines. Dominance aggression occurs overwhelmingly in males (90% of cases). Who’s The Boss In Your Household?